Although we can't feel it, we're in constant motion: the earth spins on its axis at about 1,600 km/h; it orbits around the sun at about 100,000 km/h; the sun orbits our Milky Way galaxy at about 850,000 km/h; and the Milky Way galaxy and its companion galaxy Andromeda are moving with respect to the expanding universe at roughly 2 million km/h (630 km per second). But what is propelling the Milky Way's race through space? Until now, scientists assumed that a dense region of the universe is pulling us toward it, in the same way that gravity made Newton's apple fall to earth. The initial "prime suspect" was called the Great Attractor, a region of a half dozen rich clusters of galaxies 150 million lightyears from the Milky Way. Soon after, attention was drawn to an area of more than two dozen rich clusters, called the Shapley Concentration, which sits 600 million lightyears beyond the Great Attractor. "By 3-d mapping the flow of galaxies through space, we found that our Milky Way galaxy is speeding away from a large, previously unidentified region of low density. 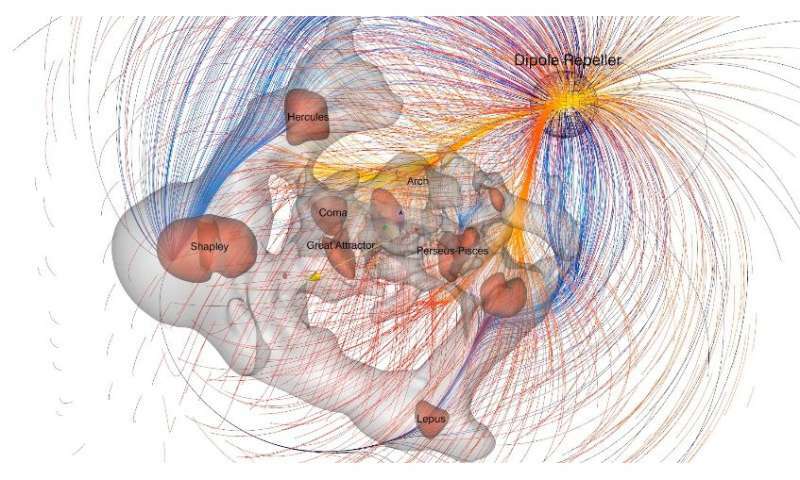 Because it repels rather than attracts, we call this region the Dipole Repeller," said Prof. Yehuda Hoffman. "In addition to being pulled towards the known Shapley Concentration, we are also being pushed away from the newly discovered Dipole Repeller. Thus it has become apparent that push and pull are of comparable importance at our location." The presence of such a low density region has been suggested previously, but confirming the absence of galaxies by observation has proved challenging. But in this new study, Hoffman, at the Hebrew university's Racah Institutes of Physics, working with colleagues in the USA and France, tried a different approach. Using powerful telescopes, among them the Hubble Space Telescope, they constructed a 3-dimensional map of the galaxy flow field. Flows are direct responses to the distribution of matter, away from regions that are relatively empty and toward regions of mass concentration; the large scale structure of the universe is encoded in the ?ow ?eld of galaxies. They studied the peculiar velocities - those in excess of the Universe's rate of expansion - of galaxies around the Milky Way, combining different datasets of peculiar velocities with a rigorous statistical analysis of their properties. They thereby inferred the underlying mass distribution that consists of dark matter and luminous galaxies—over-dense regions that attract and under-dense ones that repel. By identifying the Dipole Repeller, the researchers were able to reconcile both the direction of the Milky Way's motion and its magnitude. They expect that future ultra-sensitive surveys at optical, near-infrared and radio wavelengths will directly identify the few galaxies expected to lie in this void, and directly confirm the void associated with the Dipole Repeller. Explainer: What is the Great Attractor and its pull on the Milky Way? Note that this is not in any way new physics, simply the predictable effect of a significant local under-density. Video linked in the article above now works. A "Mass Repeller" force with no mechanism yet theorized? When describing the gravitational dynamics in co-moving coordinates, by which the expansion of the Universe is factored out, underdensities repel and overdensities attract. So, no. No new force, here.